Speaking of toys, one of my latest favorite toys is the task manager Todoist. At work we had project management software and I made a point to route most of my day through that, but all my personal notes, todos, reminders and whatnot have been through Todoist since August. Now that I’m flying solo, I’m putting all my freelancing tasks through Todoist as well and it’s been amazing. The only thing I care about in a todo app is “what does the app assume I care about?” Productivity apps almost always work better when you follow their system instead of trying to force your system upon them. So when I started considering Todoist what really sold me was a particular blog post from the company’s founder in 2016, “Systemist: A modern productivity workflow“. The post outlines how Todoist assumptions basically start with the classic Getting Things Done (GTD) methods but let’s all admit to ourselves that some of the GTD decision tree is just in the way. What Todoist assumes I want is to capture tasks and thoughts into my inbox really quickly, from everywhere you’d expect to get tasks and thoughts. From there it assumes I want nicely filtered views while I’m in action mode so I can concentrate on only the tasks I want to work on. On these two fronts I’ve been able to more rapidly adopt Todoist than any other task application I’ve used in the past. Many features and integrations make it easy to add tasks. Perhaps most importantly they don’t feel like additional tools to learn, they’re just part of the system. Between those three options, I already was capturing more tasks than I normally would. I wholeheartedly endorse Todoist if you’re in the market for a todo application. However,going into it you should really think of it as a $30/yr application not a freemium application. The free version is great for giving you a feel for how it works, but I really cannot imagine trying to tame a monkey brain without the premium features. Labels, reminders, and comments are really all essential. I’ve been avoiding opening comments on my blog posts, but in this case I’m kind of interested to know if any of my friends use Todoist and what they think about and I’m also open to questions on how I use it. So comments are open! 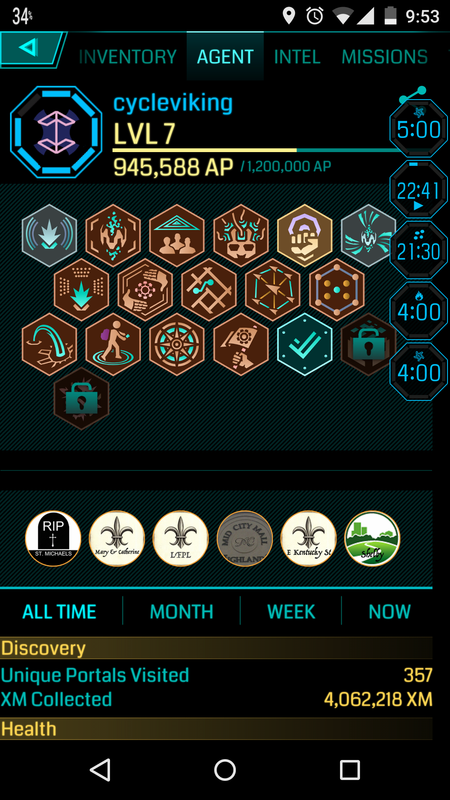 If you play Ingress, I highly recommend also installing the Integrated Timer for Ingress (Android.) The default timers are helpful when farming, but I primarily use a custom 1440 minute timer to make sure I don’t lose track of my Sojourner badge. Only 22 hours left?! I need to hack! Tap on “24:00” at my last hack of a session, and I get a nice Ingress-themed timer. Day-to-day I have enough portals around me that I usually get a hack in the morning and evening without even thinking about it. But when I was on the road for WordCamp Dayton, I actually got down to less than an hour on my Sojourner time. This timer saved my weeks of progress. Big thanks to EpicGeek, a local level 16 who shared this tip with me originally.